LAYAWAY available for some items... Just Ask for it! just 'old ancient style fired! Includes crocheted clay ring stand for Free! My pictures do not do justice to this beauties! 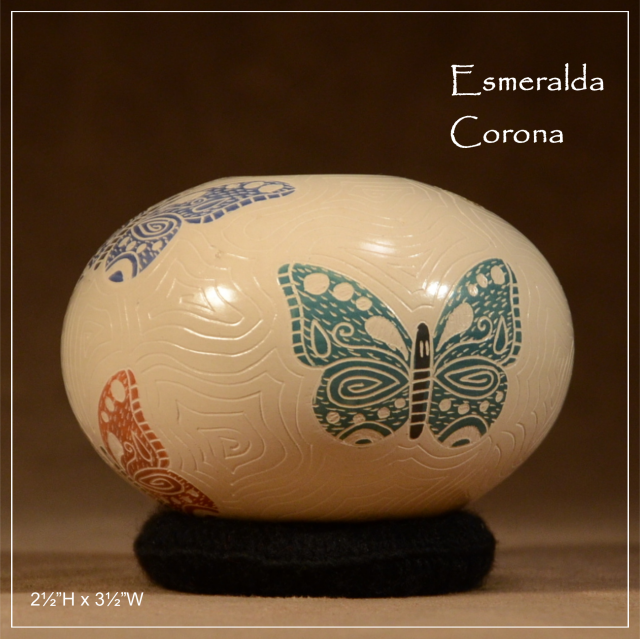 Mata Ortiz pottery is Collectable Art 100% Hand made and fired as the ancient Paquime-Casas Grandes Indians. They are fired directly on the floor, using wood or cow pats as fuel, (and in some cases, as well as in an electric or gas kiln, in order to preserve nature). The results is a magnificent piece of Art on Clay. You can set inside a plastic bag with loose sand, not tight; (use *soft, *dry and *loose desert/beach sand), to increase pottery stability. To clean, use a soft feathers duster only. NOT INTENDED TO USE FOR FOOD OR BEVERAGES. NOT WATER TIGHT. Please, don't expose to water. exclusive property of Mata Ortiz Arte/Javier Pedraza. All mail sent to the Webmaster with any questions or comments about this web site are welcome!